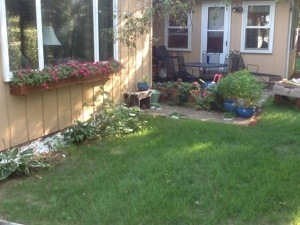 This summer was the first time I involved my two kids in one of my favorite pastimes: gardening. Knowing how their personalities and interests vary, I decided to help my son raise a vegetable garden and my daughter to arrange a pot of annuals. My son really wanted to grow a pizza garden. After we cleared up some misconceptions about where crust and pepperoni came from, we decided that our pizza garden would have peppers, three different types of tomatoes, some lettuce and onions (the last vegetable being my addition against his better judgment). 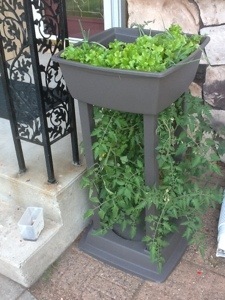 To ensure everything grew well, we used a unique container and placed it by the front door. My daughter did not need as much of her dad’s guidance as she planned her arrangement. She took what she needed from the flats of flowers I had laying around and went right to work. In no time, a very nice combination of dusty miller, impatiens and cosmos was created. Where did she learn how to do that? My guess is she had watched me use the same steps planting other beds, and either followed my lead or learned what not to do. My daughter also was integral in keeping the other backyard plantings watered during a very dry July. I also found some time this summer to garden for myself. 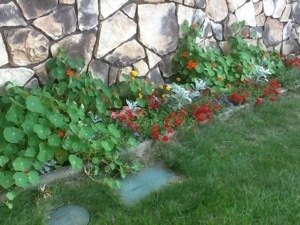 The best results I got were from my flower bed in the front of the house. The nasturtium (orange flowers, circular leaves) self-sowed from last year, coming back this spring to climb the wall once more. When deciding what to plant with it, a local expert at a greenhouse informed me that nasturtium do not like to grow in healthy soil. In fact, the poorer the better. She directed me to some companion plants such as verbena and marigolds, which prefer similar conditions. This saved me a lot of work in tilling the bed and adding fertilizers. Having over an acre to work with where I live, there is always room for new ideas and innovation. Opportunity knocked when my wife decided that the old raspberry patch had to go. After we cleared out the plot, I decided to prepare the soil for next year (vegetables are going there and would require better soil). To remediate the barren earth, I planted clover seed. This ground cover would serve as “green manure”, by putting nitrogen back into the soil as it grew. In the spring, I’ll till the clover into the bed. The way we approach our favorite hobby and share it with others seems similar to how effective teachers help their students learn. For example, we understand that students come with different backgrounds, interests and abilities. 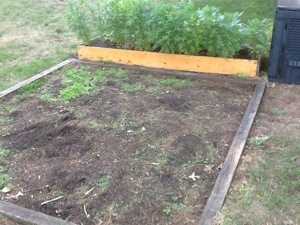 Just as I tailored the gardening activity for my kids, teachers also find different ways for everyone to be successful. The goal we had didn’t change (to plant and care for a garden, and to find joy in the activity). The same is true for the students in our classrooms. The learning target is visible and attainable, and we differentiate our instruction so everyone can attain mastery. However, we don’t alter our instruction so much that we lose sight of what we set out to accomplish. And like a hobby, learning should be an engaging experience, something our students will enjoy so much that they will pursue it independently. As the growing season starts to wind down, my family and I are enjoying our harvest of fresh veggies and blooms. My kids know they were successful by the literal fruits of their labor. Teachers also consider more authentic ways to check for understanding beyond the paper and pencil test. This concept applies to formative assessment as well as summative assessment. During the summer, if the plants would wilt, we would water them. I didn’t probe the soil to measure the water content to determine how much moisture is needed. We could tell we needed to water because we saw the immediate symptoms of something wrong. Teachers also know when their students need support, and they respond strategically even if a diagnostic assessment isn’t readily available or timely. Summers are like mini-sabbaticals for me, getting out of school to take time for myself, to be with family and friends, to think, to recharge. Time spent on other interests also helps me gain perspective and make connections between the classroom and other endeavors. A good example is my flower bed. I could have said, “The soil is poor, so I need to fix it and grow the plants I want”. However, this was the path of most resistance. Instead, I took what nature gave me and found success with the hand I was dealt. I connect this concept to some of the kids who come to our schools, those whose soil is also poor (i.e. lack of background knowledge, basic needs not met, etc.). We shouldn’t try to “fix them”, and then throw in the towel with sympathy and excuses when they don’t respond to our mismatched instruction. Teachers take them from where they are at and constantly try to move them forward, doing whatever it takes to ensure learning success. Educators continuously reflect on current practices and search for better ways to teach to keep their skills sharp. Just as I am trying out green manure, I consider new ideas learned from others that might replace my present day strategies for teaching. One example that has been around for a while is integrated units of study. Taking different subject areas and creating concept-based curriculum units that ties it all together is more authentic and puts the learning in a real-world context. Plus, it seems like a more efficient way to address the Common Core State Standards. Back in the spring I encouraged my staff to read a few books, take time for themselves and think about ways to better their instruction. As a leader, I need to follow my own advice and lead by example.